The benefits of chia seeds were well known in ancient times, and have been rediscovered in recent years. In the early history of the Americas, chia seeds were a staple food to many indigenous peoples, valued as an easily digested high-energy food in a very compact form. Today chia seeds are gaining popularity for those reasons and more as modern science has come full circle to realize that the old fashioned idea that "you are what you eat" actually has more merit than previously acknowledged. Chia seeds are a dietary supplement often referred to as a "superfood" due to their extraordinary nutritional value. Unlike other grains, chia seeds are a complete protein. This means that the seeds contain the proper proportions of all nine essential amino acids necessary to make up a complete protein. A number of researchers have conducted a nutritional analysis of chia. Among the findings of importance for nutritional supplementation purposes is that chia seed is the highest known vegetative source of omega-3 fatty acids, giving these essential nutrients with no cholesterol content, unlike omega-3 sources like fish oil. Chia contains boron, which is a trace mineral that enhances the absorption of calcium into the bones. The seeds are also high in calcium, and iron. Three and a half ounces of the seeds have been shown to contain as much omega-3 as twenty-eight ounces of salmon, as much calcium as three cups of milk, and as much iron as five cups of raw spinach. The same three and a half ounces of chia seeds also contains an amount of potassium that is equivalent to one and a half bananas, and the same amount of vegetable protein as a cup and a half of kidney beans. That same serving size contains 6.1 grams of dietary fiber, 59 mg of magnesium, and 0.5 mg of zinc. With a pleasant nutty flavor, chia seeds are easy to incorporate into the diet, making a nutritious snack when simply eaten by the handful, or used as an ingredient in salads, soups, baked goods, and countless other recipes. Researchers are still studying the medical benefits of chia seeds. Chia seeds may help reduce the risk of heart disease and stroke due to their omega-3 fatty acid content. The body doesn't produce omega-3 fatty acids, which are known to have a range of benefits in the maintenance of mental and physical health. These necessary nutrients are vital to the cardiovascular system, helping to maintain healthy blood pressure and cholesterol levels as well as reducing inflammation and thinning blood. These benefits of chia seeds are especially important to those who are at heightened risk for heart disease and stroke. In a study done by Ricardo Ayerza and W. Coates (Southwest Center for Natural Products Research and Commercialization, Office of Arid Lands Studies, The University of Arizona), cholesterol levels and other heart disease risk factors were significantly lowered in rats that were fed whole chia seeds for a period of thirty days. The omega-3 fatty acids found in chia seeds has shown some success in the relief of depression symptoms. Research has shown that deficiencies in omega-3 fatty acids are contributing factors in many mood disorders, depression among them. Supplements rich in omega-3 fatty acids have shown promising results in many who suffer such disorders, decreasing symptoms substantially in some cases. These studies show that those suffering from depression often have abnormally low levels of essential fatty acids. Supplementing the diet with omega-3 rich foods has produced a marked reduction of the symptoms of depression in many cases. Chia seeds have shown some promising results for people with type 2 diabetes as well. Since they contain a generous amount of soluble fiber, chia seeds slow the absorption of sugars and starches into the system, keeping blood glucose levels more stable. The natural anti-inflammatory and blood thinning properties of chia seeds are extremely beneficial to diabetics also, as are the natural support that chia's essential fatty acids lend to blood pressure and cholesterol control. Research done by Vladimir Vuksan, PhD, (Clinical Nutrition and Risk Factor Modification Centre, St. Michael's Hospital, Canada) has yielded some interesting findings about the benefits of chia seed use by people with type 2 diabetes. This study concludes that the use of Salba, a trademarked variety of white chia seeds, improves both major and emerging cardiovascular risk factors in those with type 2 diabetes. Among these results was a significant reduction in systolic blood pressure while maintaining good blood sugar control. Although there is not much evidence that chia helps with weight control, many dieters enjoy their high fiber content, which makes them quite filling. When added as an ingredient in meals, chia seeds add nutritional value and replace higher calorie ingredients. Their mild flavor makes them undetectable in many recipes, giving dieters a convenient method of calorie reduction that does not compromise the flavor of favorite meals. A major food crop of the Aztecs and other Native Americans, chia seeds were an invaluable source of nutrition and energy. Easy to store and transport, these seeds were used on long marches to maintain energy, as only one or two tablespoons of this nutrient rich food were said to be necessary to sustain a person through twenty-four hours of exertion. For everyday use, chia seeds were often roasted, ground into flour for cooking and baking, or made into gruel by mixing with water. Both the indigenous populations and European settlers used chia seeds for medicinal purposes, too. Mixed with water, chia seeds treat fevers, and for infected wounds, a poultice of chia seeds was often applied inside a bandage. 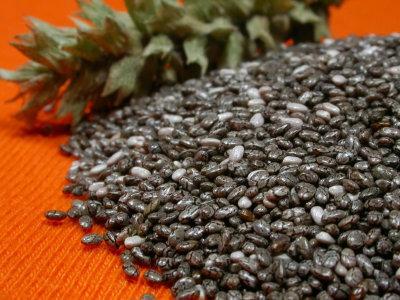 They also used chia seeds to remove foreign matter, such as sand, from the eyes and to treat eye irritation. While the results of using chia seeds medicinally may vary from one person to another, their nutritional benefits make them a healthy addition to the average diet. Even if you aren't among those who see significant decreases in blood pressure or glucose levels, chia seeds are sure to increase your intake of essential vitamins and minerals. Speak to your physician before adding chia seeds to your diet in an effort to treat an illness or condition.